I know I still owe a dispatch on the Johnny Mathis show last week, but I wanted to write about last night's Spoon and New Pornographers show at Stage AE while it was fresh in my head. "Is it a split bill?" But the New Pornographers kicked things off. At 8:00 pm, they launched into "Moves," which goes back seven years to the Together album, which it also kicked off. No Neko Case this time around, but instead we were introduced to Simi Stone, who played violin, a bit of percussion and handled Case's vocal parts with ease. Longstanding drummer Kurt Dahle has moved on, but his successor Joe Seiders was aptly described by a friend as the band's secret weapon and I can't argue. He was in-the-pocket the whole night and sang harmonies on top of that. Carl Newman (seen above) didn't have much to say between songs, which was fine because they only had 50 minutes to do their thing and they gave us a baker's dozen of their hookiest songs from all seven albums. 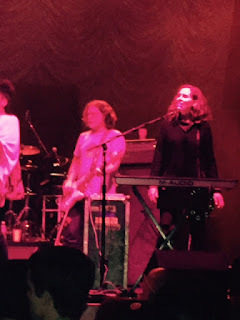 At one point, it seemed like the set list had been written to incorporate all the songs that featured "uh-uh-oh-oh" vocals parts and the like, which was a fine recurring theme. It was great hearing all the layers of vocals in "Dancehall Domine" in person. 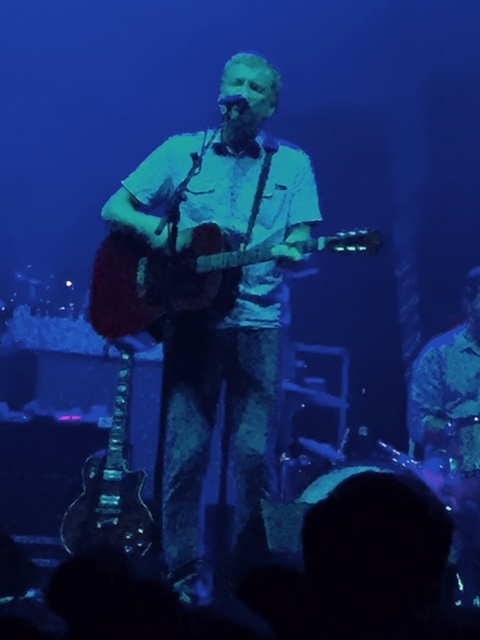 Among the surprises in the set, Newman introduced an "old prog rock song," which gave the impression a cover was on the way. Instead, they slammed into "The Jessica Numbers" from Twin Cinemas, which spends most of the time in 11/8 (I was able to count it last night) though it shifts towards the end of the verses. Again, kudos to Seiders for making it sound like he's been playing it for years and making sure that it rocked. Or swung, depending on how it's considered. Guitarist Todd Fancey did some shredding during this one as well. Even though Dan Bejar was absent from the new Whiteout Conditions album and the show, Newman pulled off a powerful reading of the enigmatic one's "Testament to Youth in Verse," complete with its bell-like coda, which Stone and keyboardist/vocalist Katherine Calder made pure bliss. Speaking of Whiteout Conditions, the recent album contains some of Newman's strongest writing in years, blending major/minor chord hooks and sharp lyrics. Some of the best were in the set, including "Colosseums" and "High Ticket Attractions." Spoon's set was more of a production. It began with Alex Fischel playing a long Fender Rhodes introduction in the dark. One almost expected flashes to go off, making the band magically appear next to him. Instead, the other four members of the band casually strolled onstage, and they launched into "Do I Have To Talk You Into It." For most of the show, the band was back lit, with strobes going off and bright lights exploding at key points during some choruses. Britt Daniel even stalked to either end of the stage mid-song, though nowhere near as dramatically as Nick Cave did a month ago (not that it's fair to make a comparison). I don't want to deny Spoon any accolades for their success and longevity after 20 years, but the presentation seemed more in line with a band like Interpol - or another band that seems more serious. The first half of the set leaned more on the band's riff songs, built on one or two note vamps, in the mid-tempo range. "I Turned My Camera On" sounded good but Jim Eno's beat was almost identical to "Inside Out" which preceded it, and took away some of the edge. But as things moved on, the energy and the mood picked up. When the bass was making my throat vibrate, the after-chorus blind flashes weren't as bad. 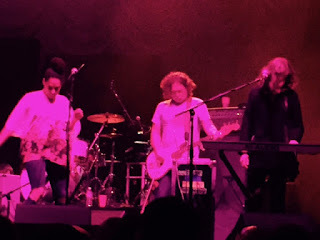 In one song during the encore, it seemed like they borrowed a trick from Mission of Burma, looping Daniel's voice and panning it between the speaker columns for a dizzying effect. While I would've preferred to hear more of Daniel's brittle guitar sound more often, the blend of Rhodes and keyboard-generated vibes brought some great nuance to the songs too. By the time Spoon said its final goodbye, at almost exactly 11:00, they had been on the stage for 90 minutes, so there's no denying they know how to put on a strong, moving set. And now I do want to hear Hot Thoughts. Johnny Mathis at a recording session in the 1960s, Photo courtesy of Columbia Archives. Heinz Hall, Downtown. 8 p.m.
Frank Sinatra might have been The Voice, but Johnny Mathis has The Voice. A few months shy of his 82nd birthday, Mr. Mathis sounds as youthful on the phone as he did on the recordings he made in the majestic-sounding Columbia 30th Street Recording Studios, starting in the late 1950s. Mitch Miller, the head of Columbia Records' pop music department, has gone down in history as one of the squarest figures in the music industry. Back then, though, he was right on the money, taking this self-described "jazzer" from San Francisco and pairing him with lush, orchestral arrangements. Mathis was discovered at the Black Hawk by George Avakian, who ran Columbia's jazz department. The 19-year old singer soon made a life-altering decision, scrapping a chance to join the USA Olympic Team in favor of a trip to New York to record an album. 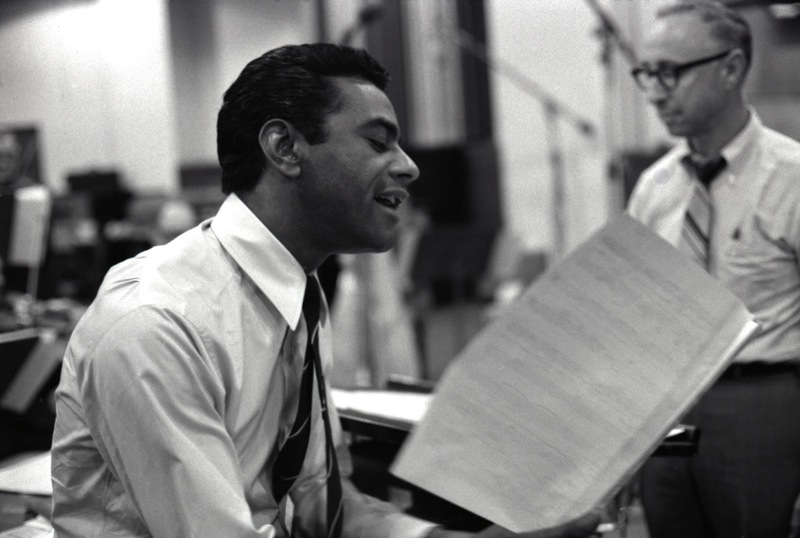 Johnny Mathis - A New Sound in Popular Song (1956) paired him up with arrangers like Gil Evans, Teo Macero and the Modern Jazz Quartet's John Lewis for a set that included "Star Eyes," "It Might As Well Be Spring" and "Babalu." Listening back today, it's impressive to hear his distinct vibrato with some often swinging charts, and to hear him cut loose on "Angel Eyes," normally taken as a dark blue, cry-in-your-cocktail number. But the album only had moderate success. Soon Miller took over, trading the bands for the orchestras of Ray Conniff or Ray Ellis. And Mathis never looked back. In advance of Mathis' appearance this weekend with the Pittsburgh Symphony Orchestra, I spoke with to him this past Monday. When I asked, "How are you," at the top of the call, he replied, "Old!" He then left fly with the first of many laughs I heard during the talk. We covered a myriad of topics, from his voice to current recordings, to his experience with Mitch Miller and the way the acoustics of the Columbia Studio helped him to deliver an important note in one of his biggest songs. I only wish the audio would be included here. His speaking voice sounded as crisp as his singing voice and he often emphasized his words as if they were lyrics. I saw you perform here five years ago. Within a few syllables I was completely blown away. So I wonder - how do you keep your voice in such good shape? Is there some regimen that you follow? I was wondering that. I'm 81, I'll be 82 in a couple months. My voice teacher was really my godsend. My dad insisted that if i wanted to sing - and he was a singer, a very good singer but he had a big family so nobody ever heard him other than us. He insisted that we find a voice teacher. I said, "Dad, I don't need a teacher. I can sing!" But he was adamant about it. and fortunately we found a wonderful woman who taught me. In some ways she might have been the catalyst not only because she taught me about the physical proprieties of singing - how to keep your throat open when you're singing, how to support your tones from the diaphragm, that sort of thing - which most opera singers know backwards and forwards. But she was an opera singer and she insisted that that's what would help me over the years. Just learn how to do it so you won't injure your vocal chords. And of course she was absolutely right. As you were starting to perform, did you feel like you were coming up with your own style? Jazz musicians are always told, "Find your own voice." Your style with the vibrato - was that something you came into on your own? The vibrato is a natural, physical occurrence. Ask Eartha Kitt. You can't control it. So no, I never thought of anything like that. Other than the fact that I didn't really like it. I thought it was girlish sounding, or something. I started singing at such an early age. Under [my teacher's] tutelage, I got a chance to go to the opera quite a lot. Living in San Francisco, I got a chance to meet a lot of singers who came through at the local jazz clubs. There were a myriad of jazz clubs in San Francisco. I listened to all these people. Along the way I was concerned about my vibrato. But I learned over a period of time how to control it. And then [laughs] I forgot about it and said, "Well, that's the way I sound!" What songs are you working on? You're going to call it The New American Songbook right? Yeah, Clive Davis is an old pal of mine. He was of course, for many years, the president of Columbia Records. He still advises me on a lot of things. He is the guy who decided he would like to produce my new album, he and Babyface. They came up with the songs. And a lot of them are good songs. It was kind of hard to find good songs in today's market that I really wanted to sing. But the kids like what they like, and of course that's the way that we grew up too, playing the songs. They came up with the Keith Urban song, "Blue Ain't Your Color." Leonard Cohen's "Hallelujah." Wow! That's got to be great. I love that! It's quite a project! We did "Hello" by Adele. "I Believe I Can Fly," R. Kelly. "Once Before I Go," Peter Allen. "Remember When," Allen Jackson. "Run to You," a Whitney Houston song. They're all songs the public are familiar with. It goes back to when I first started making albums at a very young age. I did it with Mitch Miller. We also sang songs that the audience were familiar with. Most of the songs I chose in the beginning were popular standards. You know I started singing int the '50s and '60s and there were a lot of novelty songs. Very much like nowadays. But that's kind of what I fall back on when I do my concerts. People like to hear songs that are familiar to them. I wanted to ask you about Mitch Miller. Throughout history he's gotten a bad rap but he had a vision that really worked for you. What was your working relationship like with him? The thing about Mitch was he was a classical oboist for one of the symphonies in New York, I can't remember which one. But he was absolutely adamant about wanting, as most classical musicians are...their whole life is spent learning their craft. And very few of them make a lot of money. Including Mitch Miller, so he wanted to make money. So somehow he became head of popular music at Columbia Records. He worked with all of us: Vic Damone, Rosemary Clooney. And they were very boisterous about his ability. And he had none! He hadn't a clue as to what to do in the studio. BUT, he wanted to make popular songs. So he would give us these songs to sing. Most of them were trivial. I'll never forget Rosemary, when he gave her [starts singing Clooney's classic "Come On-a My House"]. But it ended up being a hit record for her. So we had that little thing going on with Mitch. I was 19 years old, maybe 20 at the time. I was looking for somebody to guide me. George Avakian - God bless him, he's still alive and almost 100 years old now [NOTE: Avakian turned 98 this year] - signed me. We tried a little bit of jazz orientated first album that didn't impress anyone, other than some vocal pyrotechnics here and there on my part. We met Mitch Miller and I said, "Yeah, let's do something." So he came up with a pile of songs and handed them to me. It was as tall is I was. I picked out four songs. "It's Not for Me To Say," "Wonderful Wonderful," "When Sunny Gets Blue," and a song a new kid brought him, "Warm and Tender" by Burt Bacharach. And I was a jazzer, you know? He had to knock that out of my head. that's what he did. He was next to me and he went, "Sing. On. The-beat. Don't. Do. Anything. Otherthanthat." We got lucky. And I've nothing but good things to say about Mitch. Other than all of the things that you've heard are true. Everybody hated him. Rosemary hated him. Tony Bennett hated him. Vic Damone hated him. Because he didn't know what he was doing and he got lucky with me. Was that at a time when you didn't dare stand up to Mitch? Did you feel like you needed to listen to him? I listened to anybody who... people who didn't even know what they were talking about, I listened to them. I was a kid! Wide-eyed, And also I have a very flexible voice. I could do whatever they asked me to do, vocally. It wasn't a big deal. I'm a jazz-orientated singer. Jazzers don't care what you do, you just do it! I was good fodder for them. Mitch was just one of the many people..... I'll tell you this: I thought I was going to have more oversight when I went into the studio. But when I was singing and making my recordings, everybody was adamant about getting the instrumentation correct or hearing the sound of their voice right. But absolutely zero kind of help that I could get vocally. It was nonexistent. It just was not there because I guess they felt that if I was a signed, contract singer that I knew what I was doing. But I certainly didn't. And I needed all the help I could get. and the first person that gave me any parameters about singing was Mitch Miller. Prior to that, would you be waiting for feedback, only to be told, "Great! Let's go to the next song"? Well, mostly I listened to the people who did the charts, some of the great jazz artists were on my first album. Like Gil Evans and Teo Macero. And John Lewis, of the Modern Jazz Quartet. They were very nice and they were concerned about getting the arrangement done. Not a peep as far as what to sing or how to sing it. I was really quite on my own. All my great vocal heroes at the time - you have to remember that I was 13, 14 years old when I was heard by George -they were all girl singers. And jazz singers. I was really unstructured as far as singing on the beat, and singing with an orchestration. I was all over the place, and that's the way the first album turned out. I would sing pretty well and towards the end of the song, I would think, "Ahhh, this is BORing!" Then I'd go [yells out a high note], running off the melody. Most of my vocal heroes at the time were girl singers. Chris Connor, June Christie, Ella Fitzgerald, Sarah Vaughn, Lena Horne. For some reason, those were the voices that I liked. I tried to emulate them. I copied what I thought I really liked as far as vocalizing on a song. If I liked one person's rendition of i then ...[that's what I emulated]. As far as "Angel Eyes" was concerned, I remember falling in love with a version I heard which was quite different from the way the song was written. But you were guessing all the time! I never had anything I was adamant about when I was making those first recording. George Avakian... was just interested in the fact that I was very young and I sang jazzy stuff. Because he was the head of jazz at the time. Eventually the fact of my youth and my inexperience showed up on that first album. I was really kind of happy when Mitch gave me some direction, vocally. [Laughs] And then it got kind of boring [for Mitch]. I said, "Now I know what to do!" And he wouldn't go away. Finally he did. I think he was in the studio on occasion after that, when I did my first few albums. Actually I remember he was. Because Percy Faith hated him. Percy did my first few albums. He was a wonderful, wonderful composer and arranger. He was an artist in residence on the label at the time. So he was doing a big favor to accompany me with his orchestra at the time. And it was a big boost to my career at the time. God bless Percy Faith. The Columbia 30th Street Studios - everything I've heard out of that place sounded wonderful. As you were recording it, did you get a feel for how rich it made the sound? Absolutely. It was a church, and the record company bought the church and turned it into a recording studio. And it was absolutely the most wonderful place to sing in. I remember how Mahalia Jackson loved it. Because I used to follow her. For some reason, we got booked one after another. she just loved it. And I did too. I did so many things in that studio that I could've never done any place else. For instance, the high note in the middle of my recording of "Misty," I started singing in the hallway. And I walked into the studio [singing], "Onnnnnnnnnnnnn my own." [In the studio you could do] all sorts of crazy things like that! Because you felt so comfortable with the sound in the studio because it reverberated. And singers love to sing when the sound is reverberating. I'm going to remember that every time I hear the high-note in "Misty" now. Ha ha ha! I started in the hallway! And back then, everything was recorded completely live with everyone in the same studio, right? You didn't do overdubs did you? No, we didn't. And I did four songs in three hours for 20, 25, 30 years. Get or no get! You know - sometimes you didn't "get it" but it came out anyway. Four songs in three hours. It was always that way. I'll never forget it. And God bless [arranger/conductors] Glenn Osser and Percy Faith and all the other extraordinary arrangers that I've worked with over the years. They had to come up with these ideas, you know? So many of the songs were standard songs. Quite beautiful, but very well known songs. So they had to do their take on a song better than [what had been] recorded thousands of times. I give them a great deal of credit. And they were working with a young, unknown singer! But things took off within a few years, right? Yeah, and after the success of my single recordings, [pauses] I had all my knowledge of songs instilled in me by listening to all these jazzers over the years that I had mentioned to you earlier. And they sang all standard songs. So all of my repertoire at that time, being so young, was all the songs I had heard all these jazz singers sing - Ella, Sarah, all the rest. That was my trunkfull of songs. Then when I asked to make albums, Mitch was at a loss because he didn't know any of these songs. At least he sat in the studio and listened. Because when people like Percy Faith, who was a working artist himself, had a very little patience with someone like Mitch Miller who knew nothing about what he was doing. Shot in the dark all the time, all the time. He was quite a little bit intrusive and not very polite about it. He was just looking to find successful songs. It didn't matter the quality of songs, or how it came about, or how it was recorded. But he was very much interested in making money. Which isn't a bad idea. A lot of people are that way. But Mitch was doing it with very little knowledge of what he was talking about. That's what got under the skin of all these learned musicians. He was a wonderful musician. He certainly knew nothing about making records. After awhile, getting into the 1960s, would you be the one who picked everything - the concept for the album and the songs? Yes. Along the way, I met people like Bob Prince, who very early on was in the studio as a young, aspiring producer. [Prince arranges and plays a few songs on A New Sound In Popular Song] He was also a wonderful musician. And he liked my singing. He helped me in so many ways. He was my liaison between the record company and the orchestra that was going to accompany me on my next project. I always have to remember to give him credit because I was at the mercy of the people who were in this building that I had never met. But they were the business people of the record. So when it was time for me to make an album, because basically that's what I did a lot. The single records were kind of [the case where] I'd run in do something but I never thought too much about it because the songs were all new. They were all written by local songwriters, [who gave] me a little idea about the song. But other than that, it seemed that because I could really learn some of these songs really fast and go into the studio, record them according to their likes. The writer was always there saying, "Okay, that's very good. I like that." One final, off-the-wall question. Since you came up in an era when albums were popular, do you have a preference in the vinyl vs. digital debate? Do you prefer records to CDs? Oh, gosh. I never thought about it too much. There are people who have brought it to my attention, the differences. But I really don't. I know when I hear music and it's reproduced beautifully. The only thing I noticed was the early recordings that I did at the studio in New York, the old church, how wonderful [it sounds]. And I never, ever was able to reproduce that sound or hear that sound on my voice after we stopped recording there. Everything sounded very flat. They lost the roundness because, of course, it was a church. Evidently it was just the right amount of reverberation in the walls and what have you. Because we've never been able to get that sound again. By that time, we had hit the 30-minute mark. I still had a handful of questions (any artists you listen to that might surprise your fans? ; will you please sing "When Sunny Gets Blue" this weekend?) but they'll have to wait for another time. Steve Coleman stepped away from his long-standing band Five Elements for his latest release. It doesn't mark a radical departure from his idiosyncratic rhythmic cycles. Natal Eclipse also includes Five Elements members Jonathan Finlayson (trumpet), Jen Shyu (vocal) and Maria Grand (tenor saxophone). Conspicuously absent from the set is a trap drummer, after previous releases that included upwards of two of them, in addition to a percussionist. Neeraj Mehta adds percussion to half the album, sometimes setting a tempo, while other times it adds extra coloring to the music. All ears move towards the melodic landscape, which is rich, dense and alluring, to say the least. The musicians above, and Coleman's alto saxophone, are joined by Matt Mitchell (piano), Rane Moore (clarinet), Kristin Lee (violin) and Greg Chudzik (bass). (Note: the personnel gives the session an equal gender balance.) Mitchell's name should be familiar from work with Tim Berne and Rudresh Mahanthappa and his own albums (more recently, a solo disc of Berne's music on piano). The remaining three play classical music, though they fit right in with the improvisational nature of this work. Moore's clarinet adds a rich quality together with Coleman and Grand. Lee's violin brings a bit of mystery to the set. Chudzik has the most challenging task of all: keeping the tempos steady and secure. Often he's plucking a single note through the shifting rhythms, which could be tediously simple but more likely requires the discipline and focus of his conservatory background. In "Shoulder Roll," he finally gets a chance to "solo" and he executes the work so clearly, it's hard to tell if it was spontaneous or composed. Either way, it must be heard. Coleman found inspiration for Morphogenesis in the moves utilized by boxers. Titles like "Inside Game," "Dancing and Jabbing" and "Shoulder Roll" bear this out. Musically, Coleman's crisp alto begins "Pull Counter" in a manner that evokes both the sport and ballet, playing against the strings and reeds, before Shyu joins him the staccato pops of the melody, and Mitchell and Chudzik add some angular but firm accompaniment. The album's title, Coleman says, is used to define the "process that causes an organism to develop its form." 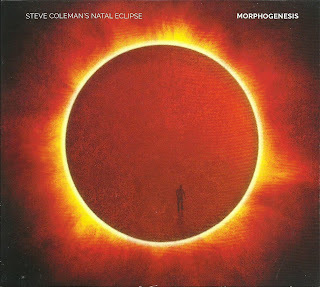 It epitomizes the way he composes the music and explains "Morphing" a 14-minute track that unfolds through Coleman's playing, with his bandmates alternately grabbing the line from him and accentuating his thoughts. By the final quarter, Coleman and Finlayson play one line together while Shyu sings a counter melody (if it can be called that) and Moore's clarinet adds shades of sound in the background. Not all of Morphogenesis is built on multiple layers. "NOH" and "SPAN" were improvised in the studio, the latter creating an especially tight vamp with counterpoint and accents that shift on and off the beat. Shyu , who also uses her voice like a skillful insftumentalist, adds more "Horda" is composed but built on an electric bit of group improvisation. All of this description might give the false impression of Coleman being impenetrable or as challenging as the heaviest modern new music. Quite the contrary. His alto cuts through with a welcoming, warm quality and his arrangements, jumpy as they might be, compel listeners to follow the melody to see where it leads, who will take and to remember what to further explore on the next listen. Speaking of Five Elements, guitarist Miles Okazaki has been a member of that group for eight years, in addition to work as a leader. Trickster (his Pi debut) came out back in March and this seemed like the best time to finally put words down about this interesting release. The guitarist has a similar sort of quest as Coleman, finding inspiration for his writing in non-musical settings. In this case, Okazaki was inspired by tricksters from literature, who "disrupt the state of things and break taboos and conventions," much like he and Coleman do in their writing. 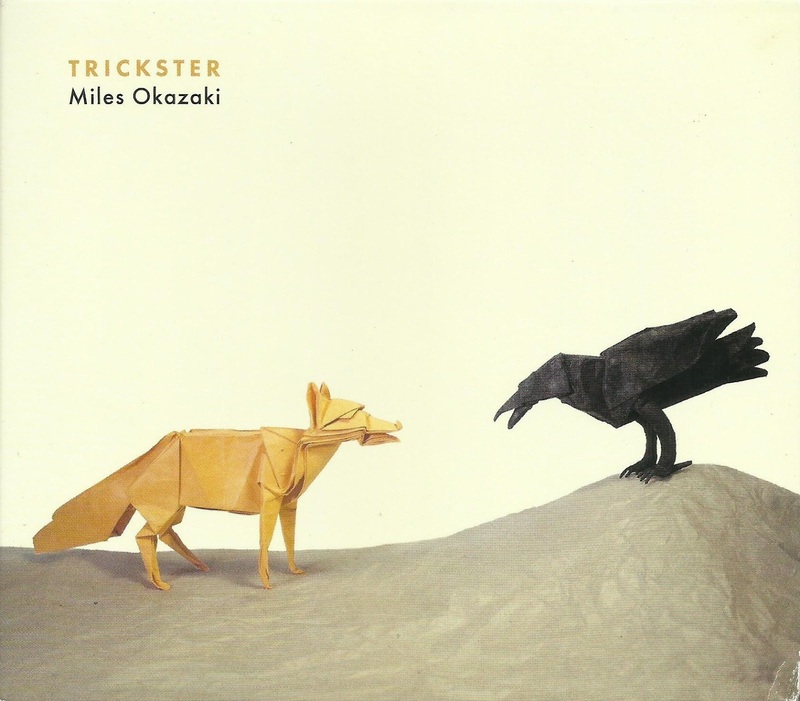 Like the saxophonist, Okazaki thrives in unusual rhythms, going so far to say the approach represents the nature of the tricksters. Each track depicts a different troublemaker, with explanations in each track covered in the liner notes. It's surprising that all of the pieces are built on groups of 12 or 16 bar structures played in either 4/4 or 3/4. Inside those structures are "folds" or twists that can trip up the listener. Okazaki's writing often turns on a dime, rhythmically, but when he or pianist Craig Taborn take solos, they often do it over a vamp created by the song's central rhythm. When this happens, the quartet sounds steady but never rigid. The guitar has a clean, sleek tone that comes to life during the solos. Bassist Anthony Tidd and drummer Sean Rickman, both also Five Elements members, offer the perfect support, firm yet groovy. Taborn and Okazaki create a very "classic" '50s style guitar/piano blend on "Kudzu," which they channel into a very modern melody. Later in the piece Tidd slips into the bass's sub-register, making it sound like the instrument is coming unspooled even as it holds down the fort. Rickman gets his chance to work in multiple rhythms on top of one another in the tense "The West." "The Calendar" provides the album's most beautiful moment, and it lasts over nine minutes. Built on the trickster myth of the Egyptian god Thoth, who played a game of dice with the moon, it feels repetitive though the bass and piano shift underneath it and the crack of Rickman's snare drum never stays in the same place. The blend of the group feels pretty hypnotic. The cover of Trickster depicts two origami sculptures, a fox and a raven, each made from a single piece of paper. On the back cover, both sheets are unfolded to show how complexity came from simple means. Okazaki did this because it explains the music so well. It also proves the importance of listening closely and discovering how all those folds and contours work. I wrote a short piece about Geri Allen's passing, which will run in City Paper this week. Not knowing that I would only have a little bit of space to reflect on the pianist's death last week, I reached out to composer/trombonist/professor at Columbia University George Lewis, who Allen brought to town last year for a few performances. "...We just lost one of the leading musicians of our time. Playing with Geri was a dream, and I was privileged to live that dream more than once. As you know, we worked on software interactivity performances (at least three), and she understood interactivity at a philosophically deep level because she could read minds while she played. "Around the time of our telematic collaboration at Pitt, we were talking animatedly about all the new things she was doing and planning. She was taking the Jazz Studies program at Pitt in directions that were unimaginably great, and she could do this because of her extremely open mind and her ability to understand and support diverse viewpoints, which was also why she was able to perform with the widest range of creative people. She was a creative musician of the very highest order, and our loss is incalculable." George also included this link to performance with Allen from 2012. This is another Interactive Trio one that is a little longer.